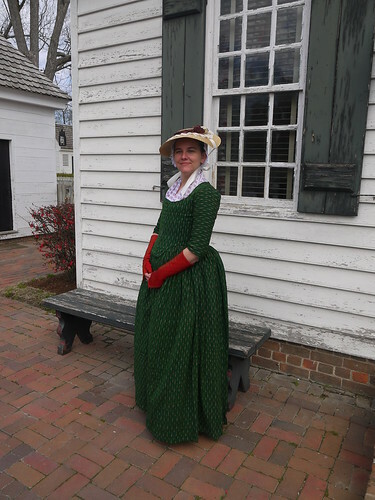 I was going to take a break from the 18th century posts to take a look at some of my other costumes, but since I wore this one to Costume College this year, I thought I'd write it up. For your reading pleasure, I give you the green ikat round gown. Aubry, of A Fractured Fairytale, wanted to make an ikat gown for Williamsburg and ordered this green ikat fabric thinking it would be much lighter in color than it was. When she got it, she decided it wasn't the right color for her and offered it to me. I was MORE than happy to take it off her hands since I really think jewel tones are my colors. I'd made 18th century anglaises in the past, but this fabric really called out to be a round gown with a pleated en fourreau back. 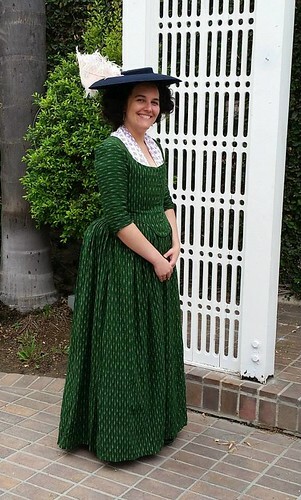 I had never made a round gown and the last time I'd done an en fourreau was for the Colonial Coquette. Needless to say, my skills have improved since then! 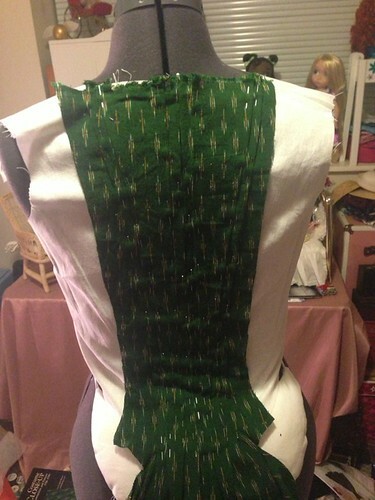 I started out by making the lining out of linen and pleating the back to it. I originally did this flat, but I futzed around with it on my dress form until I was happy with the pleats. I then stitched it all down. Of course I had to hand sew those pleats down. Which then led to hand sewing in the lining. Then the sleeves. And then I'd accidentally hand sewn the whole thing. Oops? I love everything about this dress. 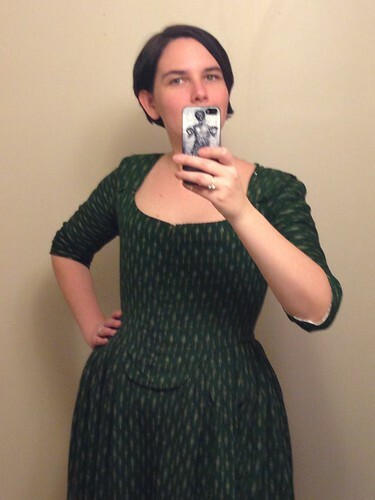 The color, the fabric, the fit of my awesome 18th century block - it all came out exactly as I'd envisioned it. I bought a neck-handkerchief from Burnley and Trowbridge, red stockings from American Duchess, and wore my old cap and hat with it. The mitts in the picture were part of a trade with Aubry. At Costume College, I wore my hedgehog wig and black felt Williamsburg hat. AAH omg I love this. The jewel tone definitely suits you :D I've only made one 18th century gown so far, and it also ended up "accidentally" being 95% hand sewn (except for long seams) lol. Mmmm... I love that fabric! What a beautiful color! The finished gown is lovely as well. The minute I opened that fabric, it screamed Sara! So really I had no choice but to pass it along. You used it beautifully!